You know, I was scrubbing my toilet when it came to me, on being a feminist stay-at-home mom. And this is funny to all sorts of people for all sorts of reasons, because we all have our own definitions of feminism and what it means and how it should effect our lifestyle choices, particularly in areas of relationship, career, and parenting. I grew up in a culture (though not a family) that shied away from the word “feminist” like it was of bad taste, which was something I could never comprehend well. I found it odd that the very people who called me smart or capable or ambitious should also think that it was wrong to fight for the fullest, truest compensation and recognition of being such. So when the same community held motherhood, and specifically stay-at-home motherhood, as the best path for a woman, I had an understandable though subconscious negative reaction. But see, I am the product of a stay-at-home mom. I am the product of a nurturing home, held together by a mother who poured her all into us and our goings-on, who believed in me and all my parts—even my angsty, youthful feminism. And so when I sort of stumbled into motherhood, despite where I thought I wanted to be, I couldn’t not stay at home with my children. I couldn’t deprive them of what I had known. So, I, in my feminism rite, chose to stay at home with my one precious daughter, which turned into two precious daughters, and I have joyful memories and inspirations born out of that decision. Even if I didn’t make it in confidence, I have lived it in confidence. Still I couldn’t shake the feeling that I had made a choice, and so that in some way had put part of my feminism on hold. I’d invoked the right of making a choice for myself, the choice to be home, which is a very feminist thing to do; but I constantly worried that, in doing so, I’d made some choice against another facet of feminism, the part that says I need to use my abilities, my smarts, my drive for something outside the home. As a whole, women, even feminists, sell themselves incredibly short, I think. As a result, I decided to continue freelancing, very loosely clumping myself into the group of work-from-home moms, though it was not without consequence. I suffered all of the dramas that face many mothers (and even women who aren’t mothers yet): I was exhausted beyond reason. I felt guilty constantly. I worried I was inadequate to do anything, mothering included. I completely lost presence. I was always thinking about what I wasn’t doing or wasn’t accomplishing if I was at home or I was consumed with what I was missing if I stole away for a day to work. The places scrubbing a toilet can take your mind, eh? It struck me with a tingle almost that, in the name of trying to be all things for myself, I was nothing to anyone else. And I don’t think that feminism equals selfishness. To advance the cause of feminism is to say that we are all capable and worthy human beings. It’s to say that women have the right to give their all to something. It’s really a camaraderie, not an individualistic movement; and when we come together in like-mindedness and positive attitude, we watch those we love benefit from it too. Maybe it’s a co-worker. Maybe it’s a demographic. Maybe it’s your precious babies, kept safe in a clean and loving environment, watching their mommy be whatever part of herself is necessary for that day and being wholly in it and committing to work with excellence. Maybe it’s seeing her surrender to the fact that we can’t always do everything but we should try, and, in the end, to have striven for something and to have been gracious with one’s self and others is what it really is about. When I think about teaching my daughters to be feminists, I have come to two conclusions. I want them to believe in themselves and their ability to achieve anything, regardless of their gender. But the second is that I want them to believe in their ability to effect change for good on Earth. That requires that they move outside of themselves and commit to the excellence that is inclusive, that is considerate, that works on behalf of others. I want them never to differentiate between working for a global cause or keeping the floors of their families’ homes clean, so long as they are invested in where they are, doing their good work with excellence. I did make my bathroom sparkle that day. I went on to clean the kitchen and to take my girls to the park to paint. I didn’t get any writing done that day, but that’s okay. I still did good, good work. I truly loved this essay!! This is a voice that needs to be heard! Thankyou, Sarah Ann and Latonya! Thank you Liz, Sarah is amazing! 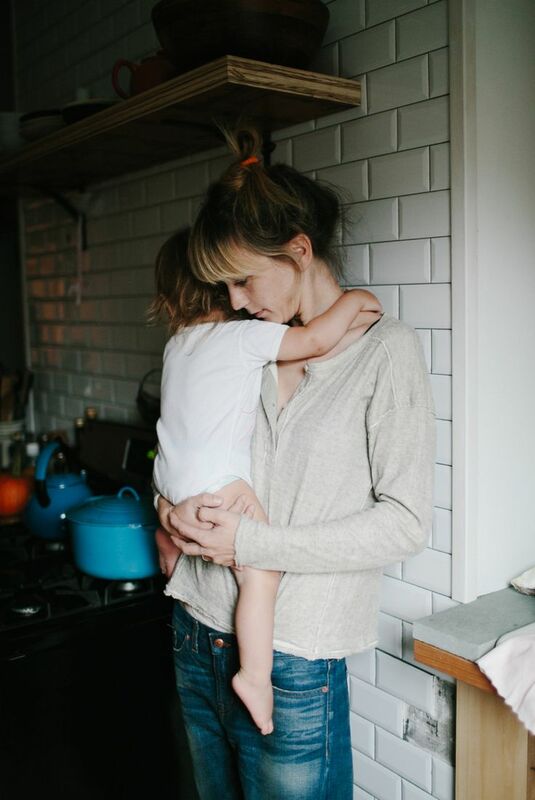 "I suffered all of the dramas that face many mothers (and even women who aren’t mothers yet): I was exhausted beyond reason. I felt guilty constantly. I worried I was inadequate to do anything, mothering included. I completely lost presence. I was always thinking about what I wasn’t doing or wasn’t accomplishing if I was at home or I was consumed with what I was missing if I stole away for a day to work. " I do think that the essence of feminism is the realization that this questions/problem/fear are only (well in most cases, there are always exceptions) for women, for mothers. Men and fathers are spared that. And this is unfair. Being feminist is realizing that difference, finding unfair and then thinking of its reasons and origins and fighting for fair treatment and equality. So Ok feminism is having the choice, but it is also important that the cost of this choice (wether financial, emotional, psychological) is the same for men and women. Thank you for commenting. I totally understand where you are coming from, and so does Sarah. And I think I can speak for both of us, when I say, that we do believe the same thing. like in most marriages, even as a feminists, you don't need to fight for your (our) position. Simply having the choice and having that choice be known and understood, and having whatever choice we make be ours, or ours- but of course, one that makes us happy as women, not because our husbands told us to be happy. Is being a feminist. No matter if we choose to be a stay at home mom, whether the reason behind it, let that be a choice. And in the relationships that we are both involved in, our husbands are equally making choices and sacrifices, so we can be the best of who we want to be as individuals. Sorry for the run on. I hope this makes sense. This just left me breathless. No matter what we fill our days with, I think we all, as mothers, wonder if we've chosen the ways to fill our days and what our children will learn from watching us. Here's to hoping they one day do good work with excellence, whatever that work is. Thanks so much for your thoughts. I LOVE when the words I write can spark a conversation. I know I said it in the article, but I think it's cool that there are different versions of feminism–we all see it differently based on how our lives are playing out and the choices we are making. I am with you–it's not just choices that MAKE equality, so you're totally on to something there. But I think, from my point of view, emotional costs for men and women just will always be different. I see it as biology. As feminine mystique. In a lot of ways, I don't want to be equal with a man, because we are hardwired differently, and I love what my make-up makes me. For example, the simple thought of maternal instinct. We don't know HOW we know what to do with our babies, except that we just do. It's just there. That's a privilege that exists for mothers that I don't think exists in the same way for even the most loving and hands-on fathers. In the same rite, I don't think my husband leaves the house for work without feeling guilty every morning simply because it's the man's job to go; I think it's because we emote differently. He's not naturally inclined toward that guilt that women do feel. So I think there are barriers between men and women that won't be crossed because there's no getting around that we are different. This can be a really hard thing, but I think I try to see the good in it too. We are privileged as women to experience the world in this deep and emotional way. Sometimes it's so difficult; but when it's good, it's a good of the best kind. Maybe one day I'll be able to make a choice without the guilt, but probably not. At least not me. But that won't stop me from fighting for the right to make the choices and to be justly compensated and recognized for those choices. That's the part I want my daughters to know–they are worthy because they are humans. And then to look for the things that are beautiful about femininity and finding one's way. I think it's a tricky but beautiful balance to fight for the things that matter and also remember that diversity is gorgeous. We want to be treated fairly, and we should also appreciate our differences from men. This is my favorite thing I've read from you, Sarah! It's one of those 'print it out and tape it to the fridge' kind of things for me. Beautiful. Loved everything about this. Thank you.